A collaborative project of the Harry Bridges Center for Labor Studies and the University of Washington Special Collections, the Labor Archives of Washington works to preserve and make accessible the records of working people and their unions so that current and future generations understand the struggles and accomplishments of organized labor and working people. The Labor Archives was founded in 2010 following a grassroots fundraising campaign within the labor movement. Crucial support was provided by the International Longshore and Warehouse Union and the Washington State Labor Council, AFL-CIO. On-going support for the Archives continues through the efforts of the Friends of the Labor Archives. The Labor Archives of Washington is a center for research and education. As one of the largest repositories for labor materials in the United States, the Archives encompasses more than 200 collections, including the records of unions and of labor leaders and activists. 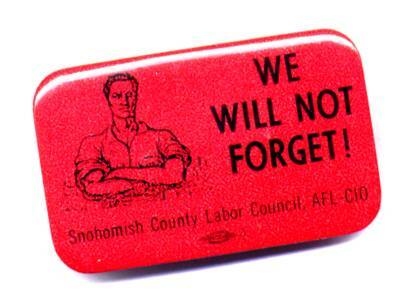 For more information, visit the Labor Archives of Washington website. The Friends of the Labor Archives is dedicated to advancing the preservation and promotion of labor history through financial support and community outreach for the Labor Archives at the University of Washington. Members of the Friends receive regular Labor Archives reproductions and souvenirs and special invitations to events highlighting the labor history education, outreach and research made possible by the Archives. Become a Friend! Individuals giving $100 or more a year and organizations giving $300 or more receive an annual membership in the Friends of the Labor Archives. Students and low-income individuals may join by giving $50 a year. To join, complete and mail a membership form along with a check to the address provided on the form, or donate through the University of Washington's secure on-line giving website. Between 2008 and 2013, more than 270 individuals, unions, university departments and others helped raised over $500,000 to provide the initial funding for the Labor Archives of Washington State. Donors of $500 or more were memorialized as members of the Labor Archives Founders' Circle. The names below are inscribed on a plaque displayed with the Harry Bridges statue at the entrance to the University of Washington's Suzzalo Library. All dollar amounts reflect total given between 2008 and 2013.